If you're looking for a safe and easy way to remove unwanted graffiti, then this is definitely the product for you. Earth Friendly Products manufactures this graffiti remover to remove paint, ink, permanent marker, crayon and adhesive from any hard surface. This non-toxic, readily-biodegradable, pH balanced formula is made using only sustainable, plant-based ingredients. Its liquid formula quickly penetrates and removes graffiti from porous surfaces such as brick, stone or concrete, as well as flat surfaces. *Please Note: We recommend testing this product on an inconspicuous area to ensure it will not damage the surface you're cleaning. For graffiti removal on plastic, laminate and painted surfaces, you may need to dilute the product 1:2 (1 part graffiti remover to 2 parts water). Test the area and increase the dilution ratio if needed. Don't forget to take a look at our other graffiti and vandalism removers, if you're looking for something in smaller quantities like our Unbelievable! Graffiti Off, which comes in 6 quart packs, or for a completely different product all together. Customers who were interested in the Earth Friendly Products ECOS™ PRO Graffiti Remover were also interested in the following items. 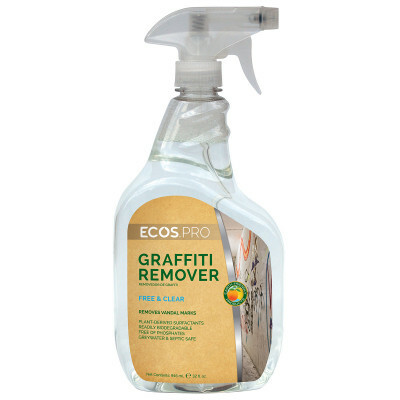 This is a review for the Earth Friendly Products ECOS™ PRO Graffiti Remover.